The report analyzes the Thermoformed Plastics Products market landscape and growth prospects for the coming years ahead, as well as identifies packaging design trends, machinery process improvements as well as continued challenges, advances in tooling, materials pricing trends and sustainable packaging issues. Thermoforming is a manufacturing process that heats plastic sheet to a pliable forming temperature then forms it to a specific shape in a mold, and trims it to create a component or end-use product. The sheet or ‘film’ is heated in an oven to a high-enough temperature that allows it to be stretched into or onto a mold and cooled to a finished shape. Thermoformers serving the packaging industry continue to thrive in 2015 with innovation in packaging design options fueling growth and new opportunities. - What is the market size in 2015 and what will the growth rate be for 2016 and beyond? 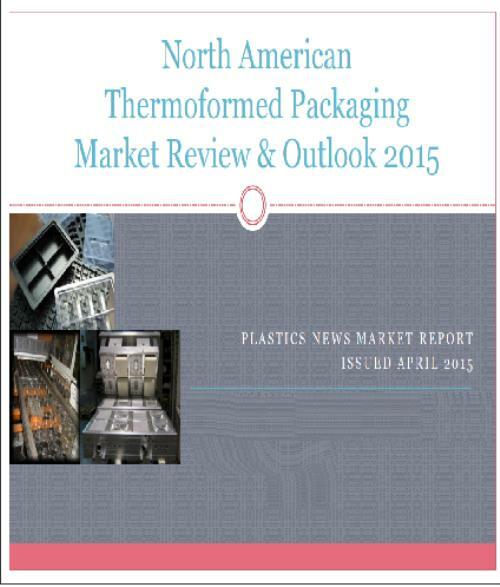 - What market trends are shaping the North American region in Thermoformed packaging (e.g., tamper-evident packaging, medical packaging security, aging equipment, process enhancements & more). - What are the key drivers and potential barriers to market growth? - What issues surrounding recycling and sustainable packaging have made gains? - How favorable is resin pricing for thermoformers in 2015? - Who are the key industry players and what are they doing to gain the competitive edge? Overall, improvements in tooling, machinery and materials will continue to make the thermoforming process a viable alternative, even more so for food packaging and healthcare applications. - Winpak Portion Packaging Inc.